Few months ago European Union made preparations for signing ceremony to integrate Ukraine with the EU. However Ukrainian President Viktor Yanukovich refused to sign the agreements and thousands of his countrymen immediately protested. A couple of dozen people has died and a couple of hundred injured during these events. What actually is happening in Kiev is only small fragment for media use, the real geopolitical game is going on in Washington, Brussels and Moscow. Ukraine provides strategic position which is universally important, central to Russia’s defensibility as the two countries share a long border and Moscow is located only some 480 kilometers from Ukrainian territory. Ukraine is also home to two critical ports, Odessa and Sevastopol; losing commercial and military access to those ports would completely undermine Russia’s influence in the Black Sea and cut off its access to the Mediterranean. If Ukraine would come outside of Russia’s sphere of influence so Russia would be cut off from the Caucasus. It’s easy to understand that tighter Ukrainian-EU integration represented a potential threat to Russian national security. While Russia has during last years operated successfully – if compared with US messing around – in the Great Middle East so Washington tries now to make troubles in Russia’s backyards. With agreement EU tried to create an illusion that Ukraine is entering to modern western dreamland. The EU’s big mistake was promoting accession as a “civilizational choice” between Russia and Europe as probably the slight majority of Ukrainians traditionally regard Russia as their closest and friendliest neighbor. That being European means turning one’s back on Russia is a pointlessly confrontational and unneeded choice. Brussels, in its munificence, promised a loan of €610 million. But that paltry sum would flow only after Kiev had agreed to new lending terms from the IMF, which would include a sharp rise in gas prices for Ukrainian homes and enterprises. 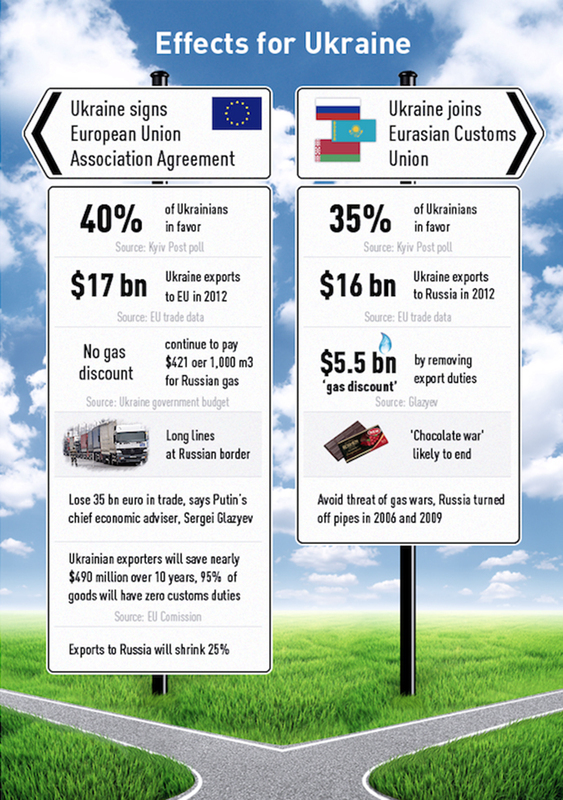 No wonder Yanukovich government wants a more balanced agreement. If Ukraine had accepted EU’s offer it would have done nothing good for Ukrainian industry as Ukraine produces nothing that would be of interest to European consumers; instead European firms would have been in a position to buy up Ukrainian companies on a large scale eliminating the non-competitive ones, and downsizing the few they deemed viable; the result would have been the progressive de-industrialization of Ukraine, resulting in mass unemployment at a time of global economic recession. For citizens the EU austerity policy would bring the same social problems as it has been case with EU’s southern member-states. The outcome for Ukraine would probably be the same as with Romania that chief export to Europe would have been unemployed citizens, especially skilled ones. For Ukraine’s Prime Minister Mykola Azarov, it was not pressure from Russia that provoked Ukraine’s flip-flop on the association deal with the European Union. Azarov said in the interview that the last drop that tilted the balance in favor of Moscow was the tough set of terms from the International Monetary Fund in exchange for a much needed rescue loan being sought by Ukraine.”We could not go with these terms,” he said. Ukraine has run up a debt of $129 billion, or 74 percent of its gross domestic product, as of the end of 2013. At a time when it needs more cash to bridge gaping holes in its public finances, Russia could prove a lender of choice. The IMF turned away the country’s policy makers with the terms it offered for its $15 billion loan, such as raising utility bills by 40 percent, according to Ukrainian Prime Minister Mykola Azarov. Russia is Ukraine’s second-biggest export market, taking $17.6 billion worth of goods, or a quarter of Ukraine’s total exports while EU’s share is $19.9 billion. Moscow has also argued that an association agreement with the EU will mean the end of the free-trade arrangement it currently has with Ukraine, raising the specter of a sudden tariff wall dropping on trade routes, and tightening border checks. The Russian response was real and pragmatic. Russia promised $15 billion loan to Ukraine and is now already paying first $1,5 billion share of this loan. Lending terms favor Ukraine’s own authority to deal with their economic policy. Russia remains Ukraine’s largest foreign investor and Ukraine still remains highly dependent on the Russian market. Ukraine’s push to secure greater energy independence for itself by developing indigenous oil and natural gas projects will not bear fruit for a number of years, and the country remains dependent on Russia for low-cost supplies of energy. Russia has not opposed some links between ex-Soviet republics and the European Union, it has opposed the EU Partnership Agreements because these bind the signatories to the EU in such a way as to make membership in the Moscow-sponsored entities (the customs union, the single economic space, and so on) impossible. The prepared Eurasian Union (EAU) is already adopting many standards based on those of the European Union, but it seeks to introduce them gradually, so as not to impoverish the local population, a point that is especially relevant given Ukraine’s fragile social and political balance. Second, they point out that European Union rules are very narrowly tailored to the needs of member states, which may not be optimal when competing for access to other markets. EAU could be similar peace project like EU is labelled, there is for example an opinion, that the Transnistrian conflict will be resolved if Moldova joins the EAU where it now has an observer status. It is possible that Vitali Klitschko becomes the next president of Ukraine. Lacking the knowledge and experience needed to govern a country, Klitschko will inevitably become a pawn in the hands of people who are about to raise him to the top of the state hierarchy hiding in the shadow of his “throne”. 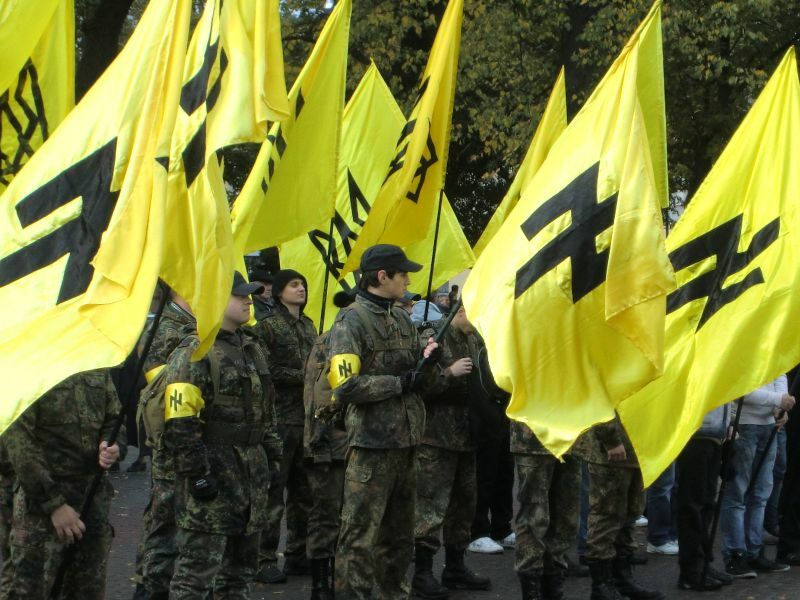 Among them will be the American consultants who work with the UDAR Party. It is interesting to take a look at just what kind of companies are mediating in contacts between Klitschko and the US Congress and American government agencies, as well as advising his staff on organizing the early presidential race. Once you’d say that what should determine who rules is the crowd in the street, not the ballot box, then of course, in almost any society there are reasons why 50-70,000 people might be discontent with the government, might go into the streets if they get sympathetic coverage in the media, you could inflate the numbers to hundreds of thousands. But even hundreds of thousands are only a small number in a country of 46 million people. And I think whether it is Ukraine today, whether it could be Italy or Spain tomorrow, once you start saying that the ballot box can be trumped by the street that is a deep threat to democracy. Far from promoting EU values and democracy and the rule of law, we seem to be able to throw them out the window in order to get our man into power. So we are seeing a kind of propaganda war, psychological war taking place using these rumors of both the crackdown domestically and even foreign interference. Whilst at the same time, the very Western media and Western governments who report these rumors completely ignore the evidence of their own involvement in supporting the opposition, providing technical training camps, providing financial and other forms of assistance, providing a media platform for them.US, the European power centers, the organization in Brussels, NATO and so on, see Ukraine as a key strategic factor. They want Ukraine to be under their thumb, under NATO’s thumb, because they are deeply hostile to Russia. They want to draw it into the Western sphere of influence. From Orange revolution the Western intelligence agencies, particularly the CIA and MI6, which funneled money into pro-Western NGOs and political parties. that at its core the initiative is nothing more than an attempt to push Russia out of Europe by drawing its boundaries further to the East. Washington is employing methods of international gangsterism, including violence, to effect a political coup aimed at installing a regime that is fully subordinate to US geo-strategic interests. 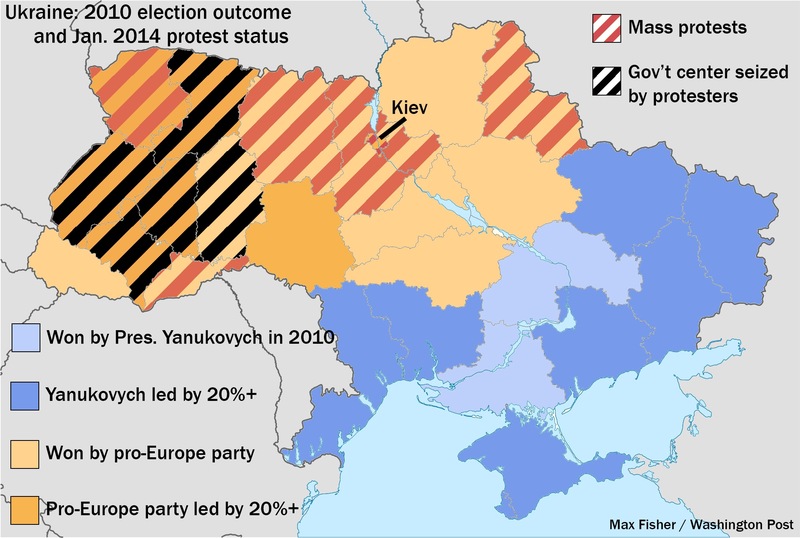 This time the bullseye is on Ukraine, the home of the failed Orange Revolution, where US NGOs fomented a populist coup that brought down the government and paved the way for years of social instability, economic hardship and, eventually, a stronger alliance with Moscow. The Ukraine president’s turn toward a deal with Russia rather than integration into the European Union was the spark for the current campaign for regime-change. The first demonstrations started when some protesters feel that their dream or great opportunity had slipped away. However any government in Ukraine has the same framework as the present one such as nonexistent real hope of EU inclusion, a dependence on Moscow for energy and an integrated economy with Russia. The country is also clear divided to toward Russia oriented eastern Ukraine whose residents speak Russian and are Russian Orthodox and to toward Europe oriented western Ukraine whose residents and speak their own dialect. The tension between the regions is real, and heavy pro-EU pressure could split the country which on the other hand might be not so bad outcome. The US media puts demonstrations in Kiev in the headlines while for example the fact that during construction works in Qatar for soccer WC 2022 already there has been hundred times more deaths than during protests in Ukraine. And related to death toll one should note that there is casualties not only among demonstrators but among supporters and workers on government side too. The US and EU approach with democracy demands and peaceful solutions is only covering the precise goal of US efforts is to shift political power into the hands of their nazi-puppets. In doing so, it aims to turn Ukraine into a US imperialist beachhead on the very border of Russia as part of its drive to assert American hegemony throughout the strategic landmass of Eurasia. This entry was posted on Wednesday, February 19th, 2014 at 1:11 pm and is filed under BalkanBlog, Black Sea region. You can follow any responses to this entry through the RSS 2.0 feed. Both comments and pings are currently closed.